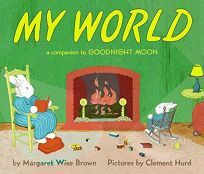 Originally published in 1949 (two years after its companion, Goodnight Moon), My World by Margaret Wise Brown, illus. by Clement Hurd, was reissued in 2001 (after being out of print for more than 30 years)-and here neatly adapts to a board book format. PW wrote, ""The volume's words and pictures stretch the boundaries of its time-honored predecessor, affirming that there is, indeed, a warm and welcoming world beyond the great green room.""